Those of you who follow me on Instagram know that our family has had a rough few months. My dad fell off a ladder at the beginning of March, shattering his wrist and injuring his knee. He finished three difficult months of recovery from wrist surgery and physical therapy last week, but had to begin the process all over again yesterday after undergoing a necessary knee surgery. On top of that, my oldest daughter Bunny had a terrible breathing attack two weeks ago, followed by trips to the emergency room and several days in the hospital. She's since been diagnosed with asthma and has been taking medicine around the clock. We capped off the week by having all three of my girls come down with a nasty cold. Put this together with sleepless nights, hours of grading to wrap up the school year, and the general stress of the past few months, and well, we're just a bit worn out over here. So when my dear friend Becca agreed to pick up a few goodies for me at Sample Spree last weekend, it was like a little ray of sunshine in the gloom. 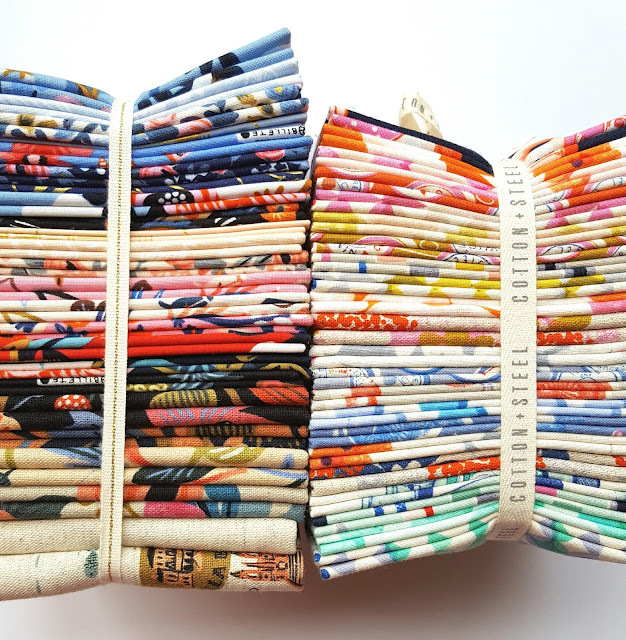 Look at these gorgeous bundles of Trinket by Melody Miller and Les Fleurs by Anna Bond. The colors, the designs...they just make my heart sing. 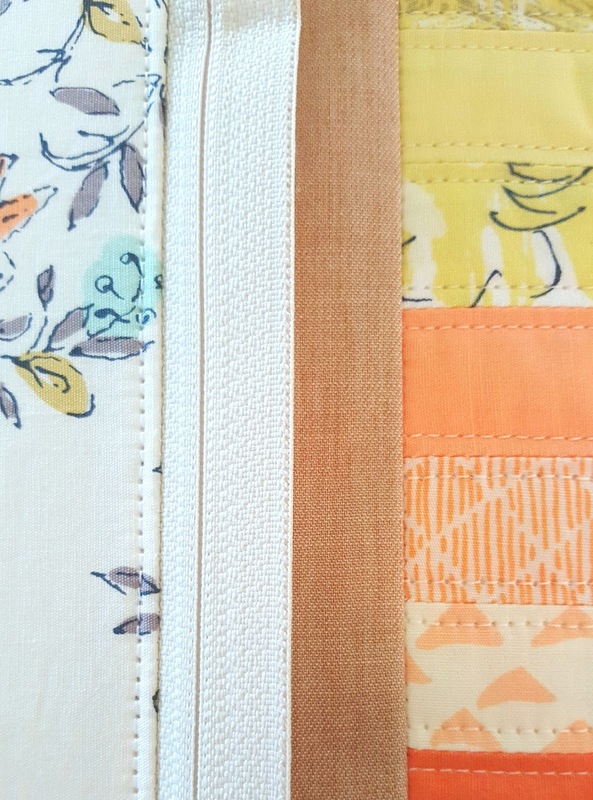 The ladies at Cotton + Steel continue to impress me with their skill in creating color stories and collection themes. It seemed like sewing up a small colorful project would be the best kind of therapy right now, so I immediately broke open the Trinket bundle, which might just be my favorite yet of Melody's beautiful collections. These prints just seem to hum with happiness. I especially love the spools, but I'm just as fond of the whistles, phones, and those sweet smiling daisies. It was so much fun fussy cutting these squares to create the front of a boxy patchwork case. 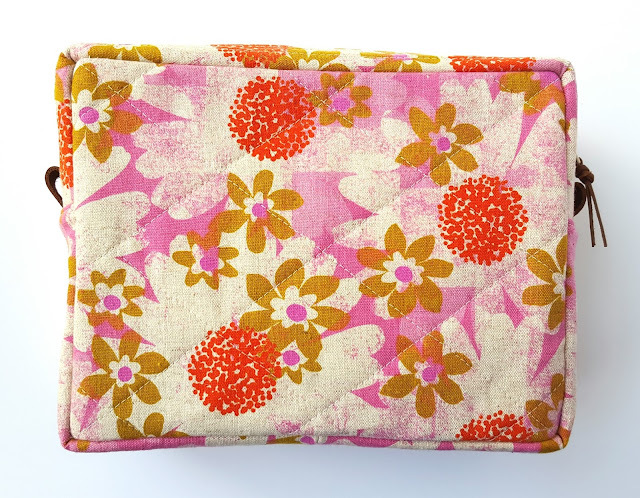 I used one of the linen floral prints for the sides and back panel. The selvage was just too lovely to leave out, and I carefully trimmed it to fit along the zipper opening. 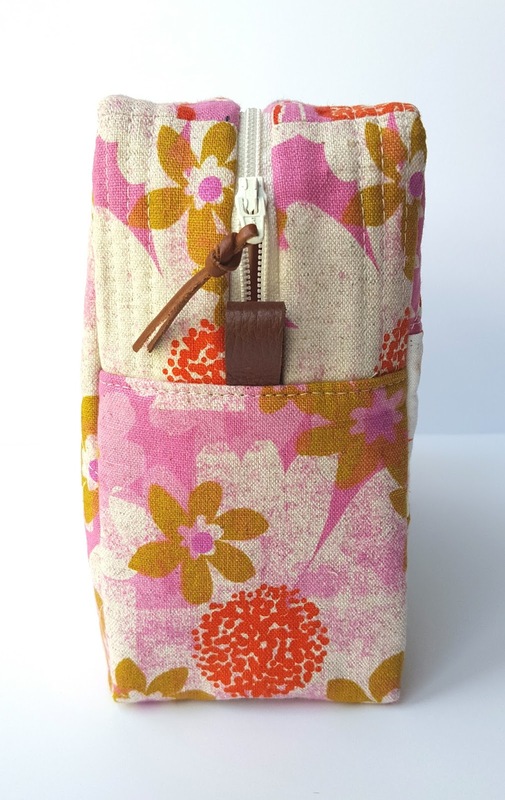 I added leather for the side tabs and zipper pull, making a wonderful contrast to the bright prints. Between you and me, when I stepped back to look at the finished case, I was so happy that I almost wanted to cry. Because even though little joys may not solve our problems, they're sometimes just enough to help us find the strength to carry on. I designed today's tutorial as a sample project for my sweet friend Sharon Holland's new fabric collection Tapestry which is making its debut this weekend at Quilt Market in Salt Lake City (look for the rest of my sample sewing in an upcoming post). 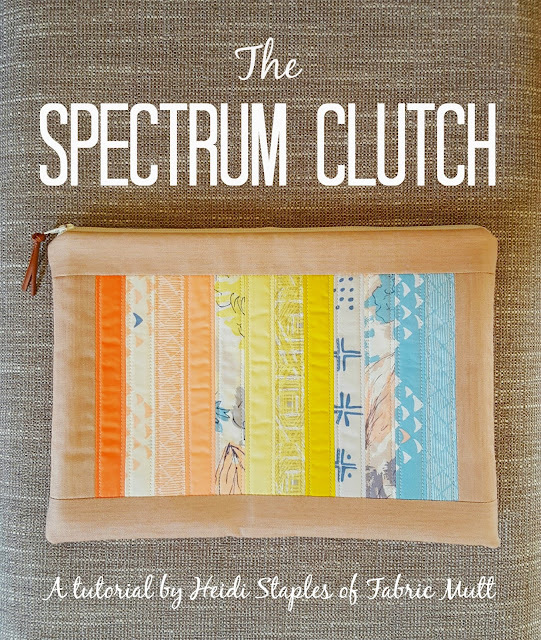 If you need a quick gift or just a little something fun to make while everyone else is off in Utah without us, this project is a great choice. Be sure to post your pictures of any finished clutches on Instagram with the hashtag #spectrumclutch and tag me too @fabricmutt. I always love to see what you guys make with my tutorials! Finished project dimensions: 8 1/2 x 11 1/4"
All seams 1/4" unless otherwise noted. 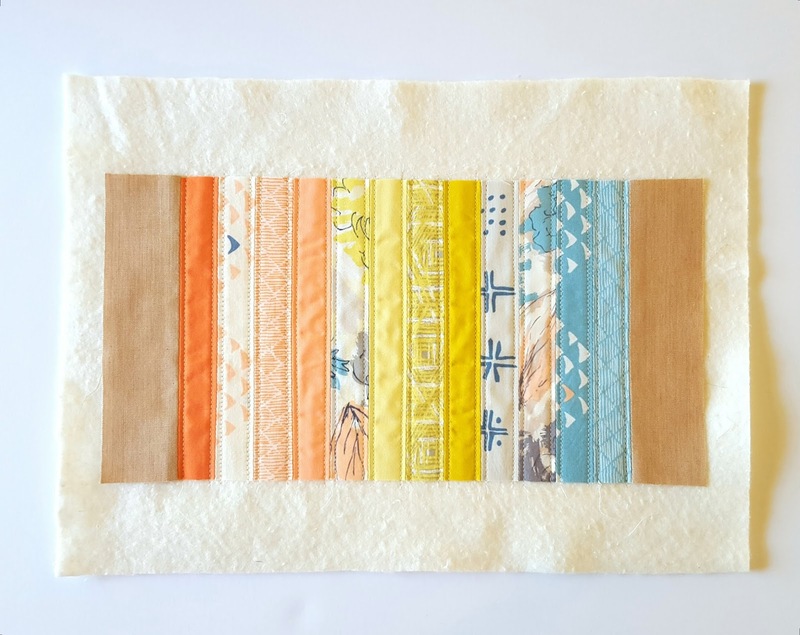 12 strips in a spectrum of colors, each one at least 1 1/4 x 6 1/2"
2 strips 1 3/4 x 11 3/4"
2 rectangles 9 x 11 3/4"
1 rectangle 10 x 13"
1 rectangle 9 x 11 3/4"
1. 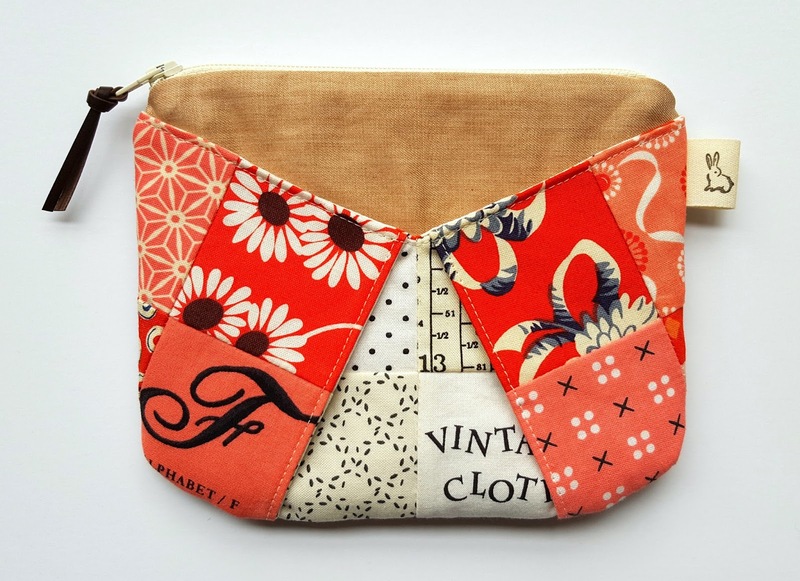 Sew all twelve strips together along the long sides to form the patchwork panel for the front of the clutch. Press all seams open. 2. 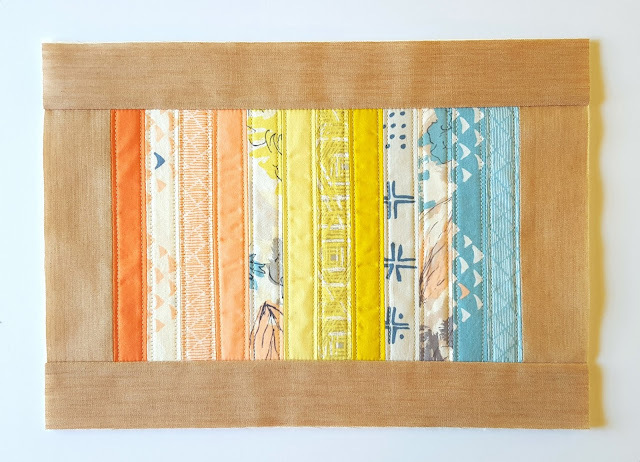 Sew a 1 3/4 x 6 1/4" denim strip to each 6 1/4" end of the patchwork panel. Use adhesive basting spray to fuse the wrong side of the piece to the center of the 10 x 13" batting rectangle. Quilt the patchwork as desired. 3. Sew the 1 3/4 x 11 3/4" strips of denim to the top and bottom edges of the patchwork panel, folding those strips over so that the wrong side of the fabric lies flat against the batting. Press and then trim the exterior front piece to 8 3/4 x 11 3/4". 4. Fuse the wrong side of the denim exterior backing to the other piece of batting using the adhesive basting spray. 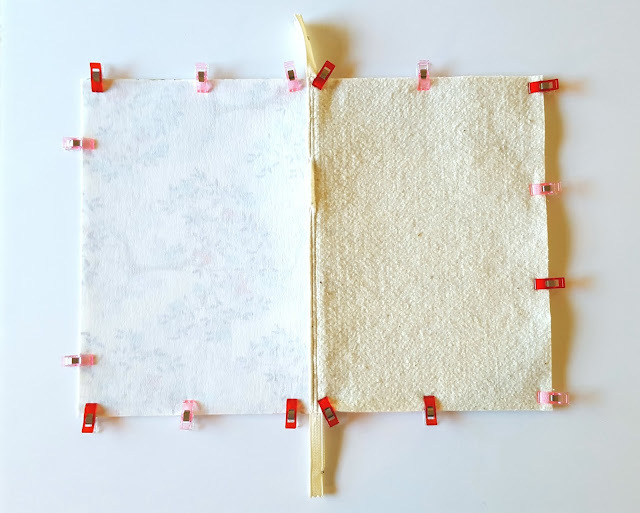 Fuse the wrong side of the two lining pieces to the two pieces of lightweight fusible interfacing (follow the manufacturer's instructions). 5. Stack in this order from bottom to top along the upper long edge of each piece: exterior front (right side up), zipper (right side down), lining piece (right side down). 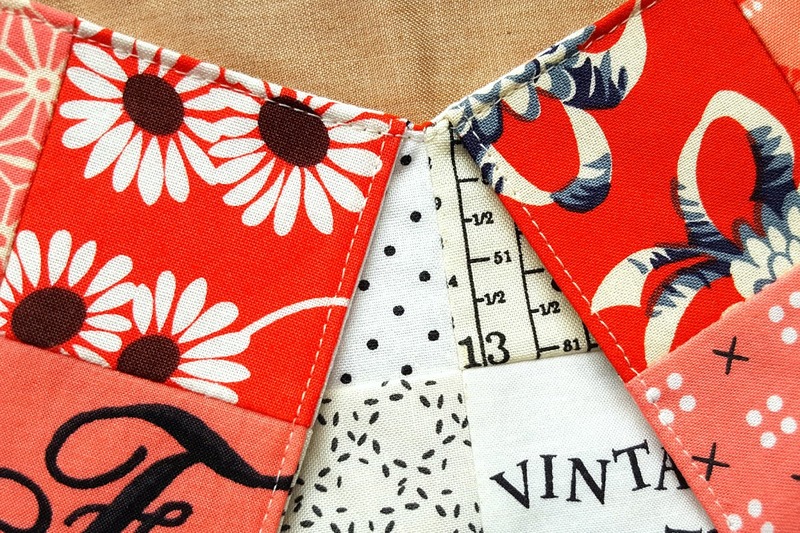 Clip them in place and then sew them together along the 11 3/4" side. If you like, fold the lining piece back from the zipper and stitch it down 1/8" from the seam so that it will hold in place against the zipper. Repeat step 5 on the other side of the zipper with the other exterior and lining pieces. 6. Unzip the zipper at least halfway (don't forget that step!). 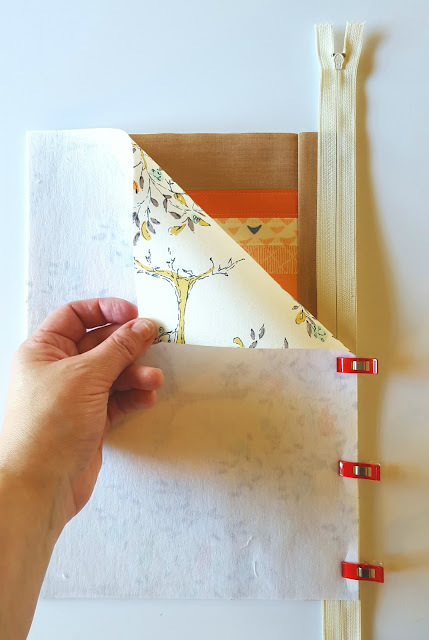 Use binding clips to hold the exterior pieces with right sides together on one side of the zipper and the lining pieces with right sides together on the other side of the zipper. Make sure the zipper teeth are pointed toward the exterior pieces. Sew all the way around the outside of the rectangle, leaving a 5-6" gap open at the bottom of the lining. 7. Trim the corners and extra pieces of zipper. Reach in through the gap in the lining to pull the bag right side out and push out the corners gently with a chopstick or knitting needle. Tuck the raw edges of the lining into the gap and stitch it closed about 1/8" from the fold. Push the lining into the bag and press. 8. 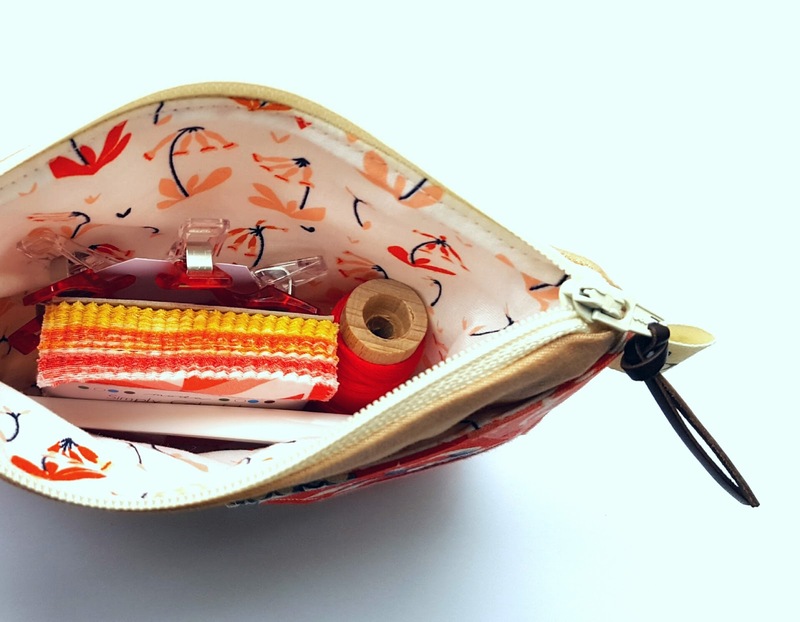 Thread the leather strip through the hole in the zipper and knot it to make a zipper pull. Fill with goodies and enjoy! 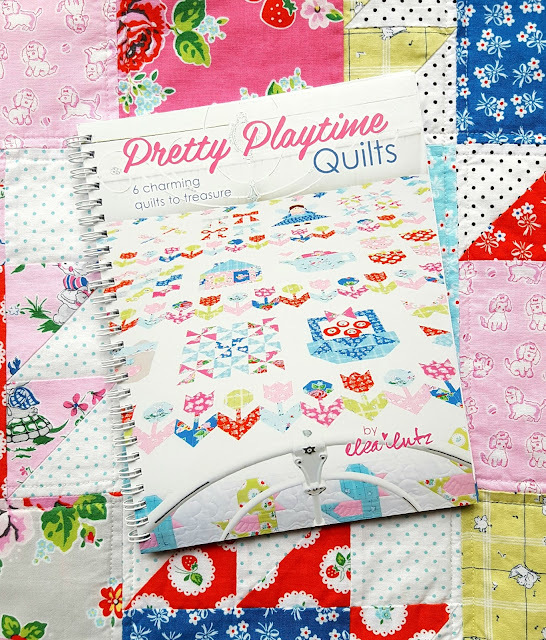 Just a quick note to all of you that the Pretty Playtime Sew Along starts next week and runs through the end of August, giving you the chance to make the adorable Garden Fairy Sampler Quilt on the cover of Elea Lutz's sweet new book! Fat Quarter Shop is hosting the event, and tons of amazing bloggers are participating including me. You can get your own copy of the book right here, and the sew along schedule is below. I finished today's project last weekend and have been dying to share it with you all week! 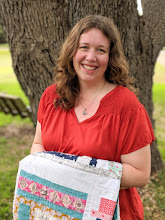 My sweet friend Caroline (who writes the incredibly popular Sew Can She blog) has just filmed her first Craftsy class, Colorful Patchwork Bags & Baskets, and asked me to be a part of her blog tour. She sent me a free code for the class and a package full of interfacing so that I was all set to try it out. 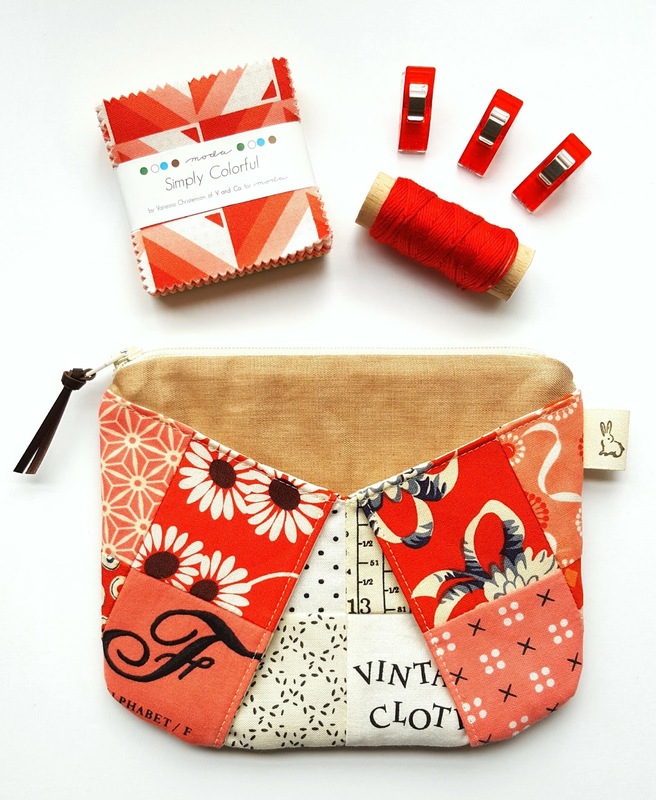 I've taken several online classes over the past few years on everything from sewing to knitting to illustrating. I can say in all honesty that this class was completely worth my time. 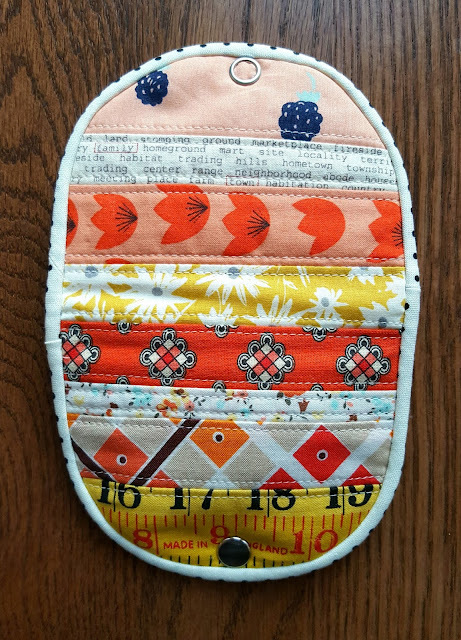 Even though I'm a veteran bag maker, I still picked up a few new tips from Caroline. 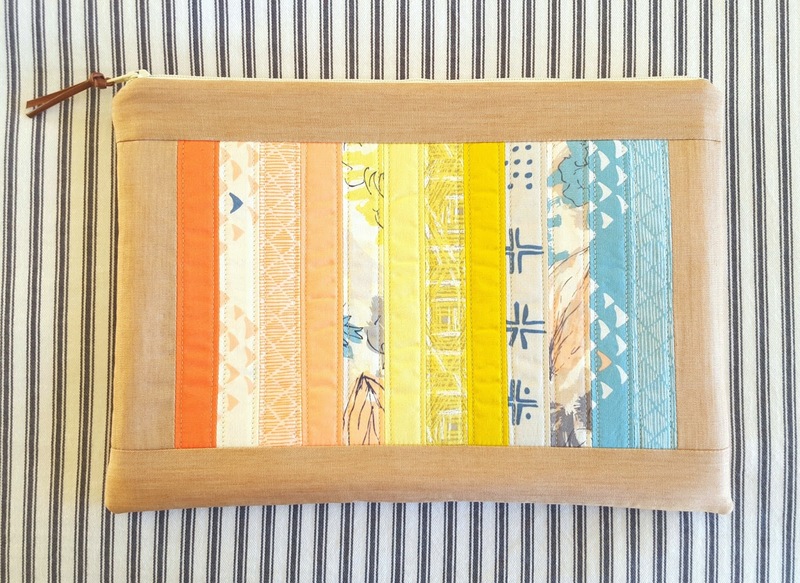 The techniques she shares for making these projects are simple yet so clever. My original plan was to make one of the baskets, but when I saw her zipper pouches, I fell completely in love. 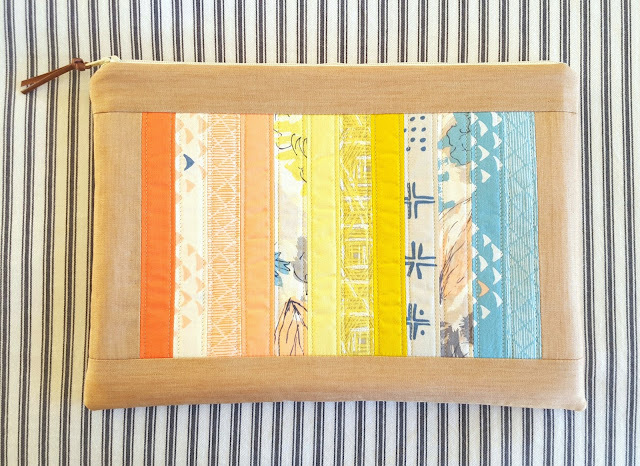 I just adore the patchwork pockets on these pouches -- so unique! Caroline uses gridded interfacing by Pellon to make perfectly nested seams, and I'm sorely tempted to use this technique on other projects as well. If you don't have the Pellon product on hand, she also shows you how to create your own version of it with regular interfacing, a pencil, and a ruler. 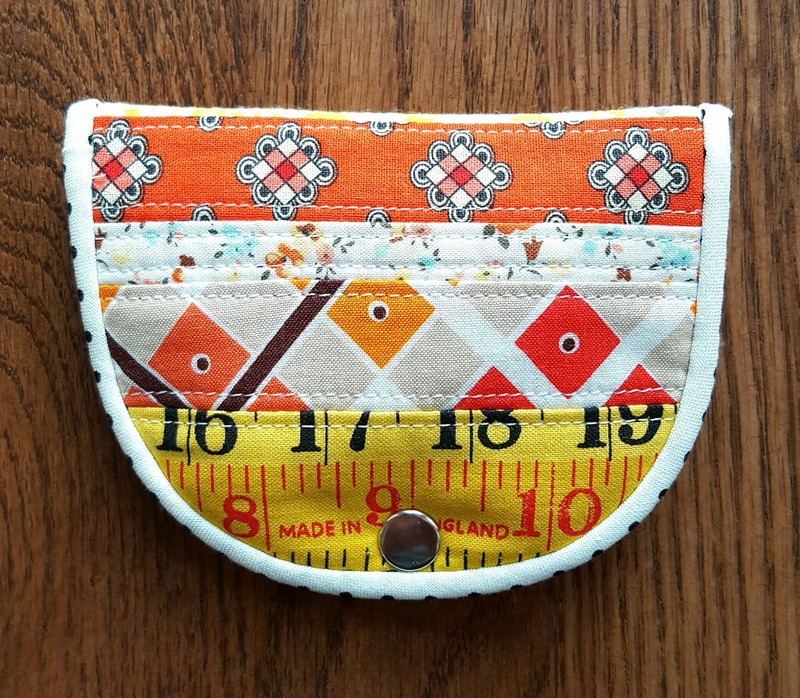 There should actually be pockets on both sides of my pouch, but sadly I trimmed my other patchwork panel the wrong way while trying to listen to another class and use my rotary cutter at the same time. (Tip of the day: do NOT be like me.) I'm already cutting out pieces for a second pouch. Wouldn't these make wonderful gifts? Just tuck in some goodies or a gift card, and you're good to go! Caroline is offering a discount code to all my readers for 50% off the class cost. Whether you're a beginner or more advanced, I really think there's something in here for you to enjoy. Please do check it out! 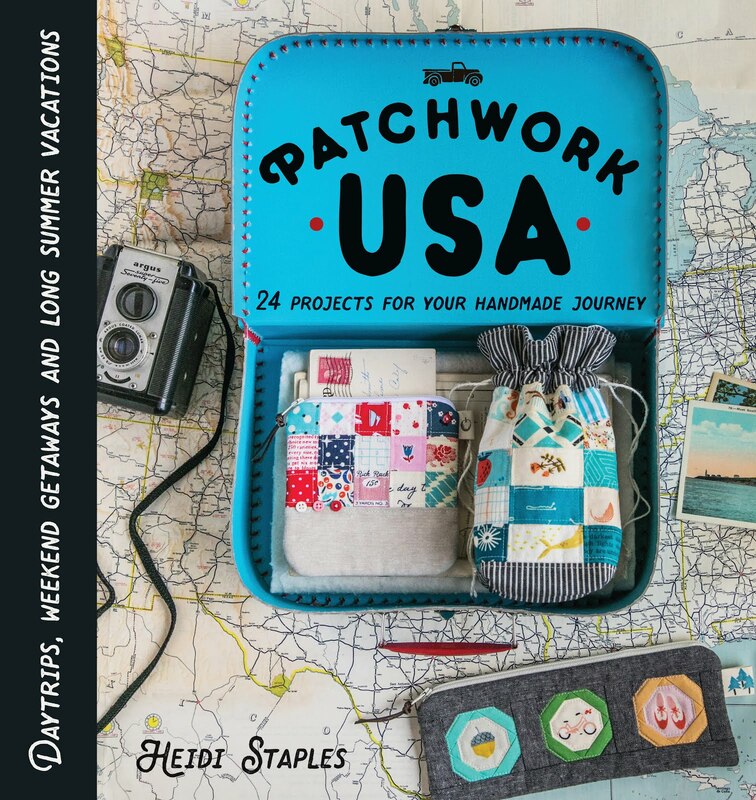 Also be sure to drop by the other stops on the Colorful Patchwork Bags & Baskets Tour -- all listed in the links below. You'll find even more information on Caroline's blog. Enjoy! This project has been on my Must Make list for a while now. 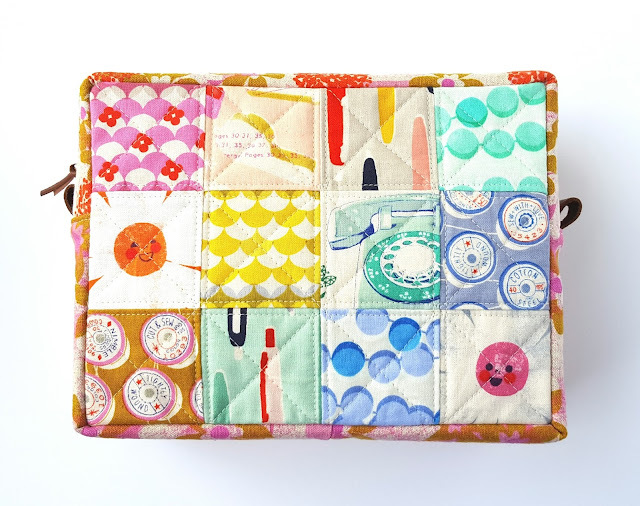 Scrap Happy Sewing by Kim Kruzich (also known as Retro Mama) is full of adorable projects to make with your leftover bits of fabric happiness. 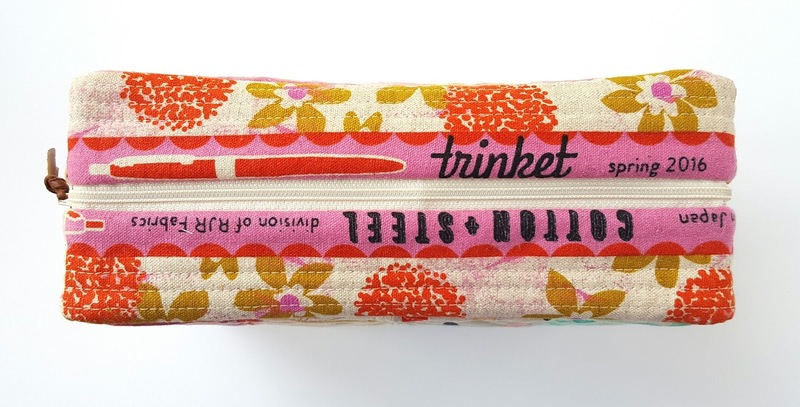 You know that I can never refuse another sewing kit, and the Simply Strippy version is adorable. 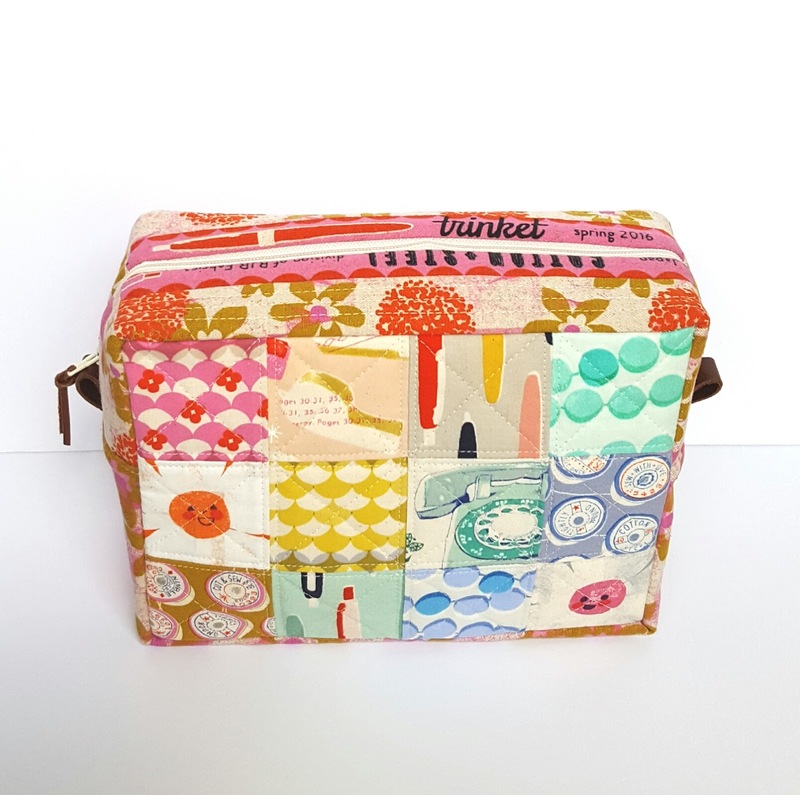 Most of the patchwork pieces for this kit came from my scrap bins, though I tossed in a few pieces of Foxglove by Aneela Hoey which came in my last fabric package -- such a beautiful collection. I added some Art Gallery Fabric denim in Adobe Clay for the inner pockets as well as an extra pocket using more Foxglove. 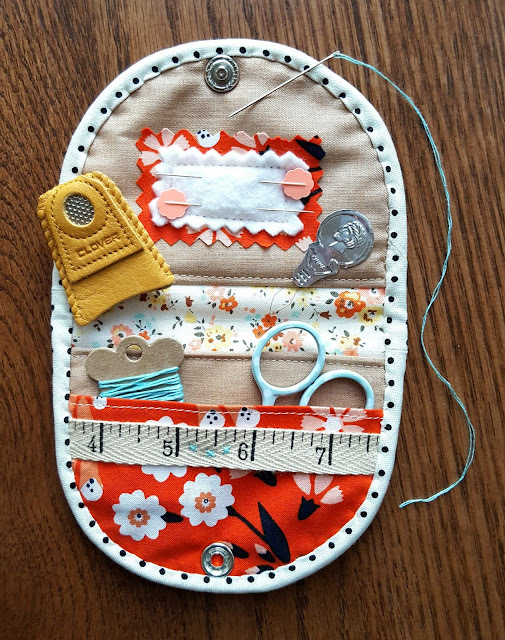 This little kit was so fun to make and a really fast sew -- about two hours of sewing in between afternoon errands and dinner with the family. The next big project on my list is setting up a sewing station for my three daughters who are finally getting their own machine. It's exciting and yes, just a little bit scary to think about how quickly they're growing up. My oldest turned 9 in February, and she's been begging for this privilege for at least a year. 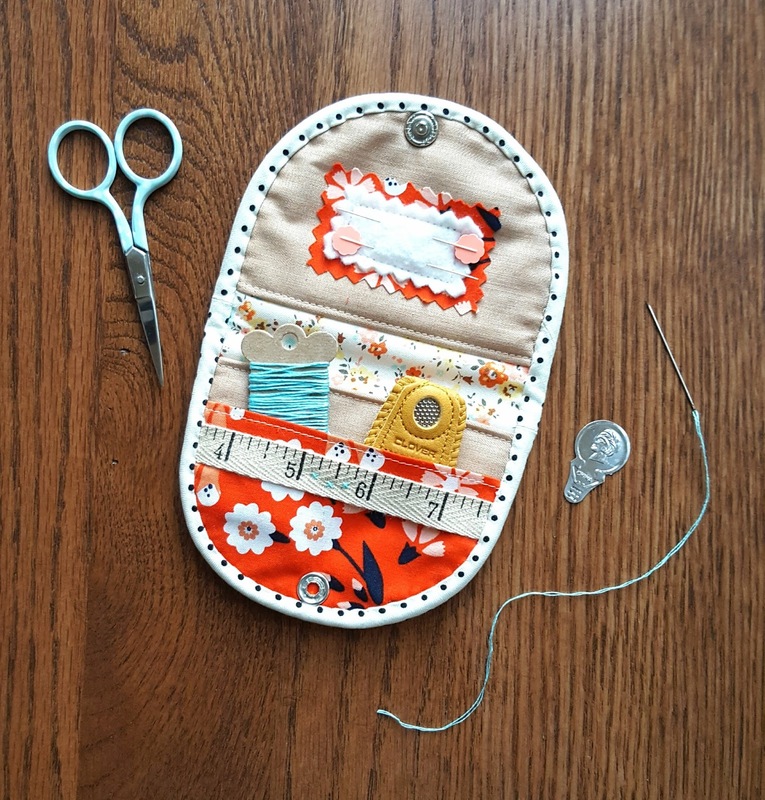 I'm taking a deep breath, stocking up on band-aids, and getting ready to become Sewing Teacher Extraordinaire this summer. Because as I spent a bit of time thinking about this whole motherhood thing during the big day yesterday, I realized that doing all that we do to take care of our kids -- while exhausting and overwhelming -- is really not the hardest part of our job. The hardest part is teaching them to be independent enough not to need us so much anymore. This stage has been quietly creeping up on me this year, and though I've never considered myself a control freak, I'm learning that it's not easy to let go. No, my girls aren't headed off to college for almost a decade yet, but now is the time to teach them that there are already things they can do for themselves. Things like folding their own laundry and helping with dinner, studying for tests and sewing birthday gifts for friends, knowing what they believe and standing up for what's right. If they can tuck these things away now, I know they'll be habits by the time they're ready to fly off on their own wings. So yes, it's time to let my girls learn how to use a sewing machine all by themselves. And I'm excited and nervous and a just a wee bit emotional. And so proud I can hardly stand it.